Take Compliance Seriously. 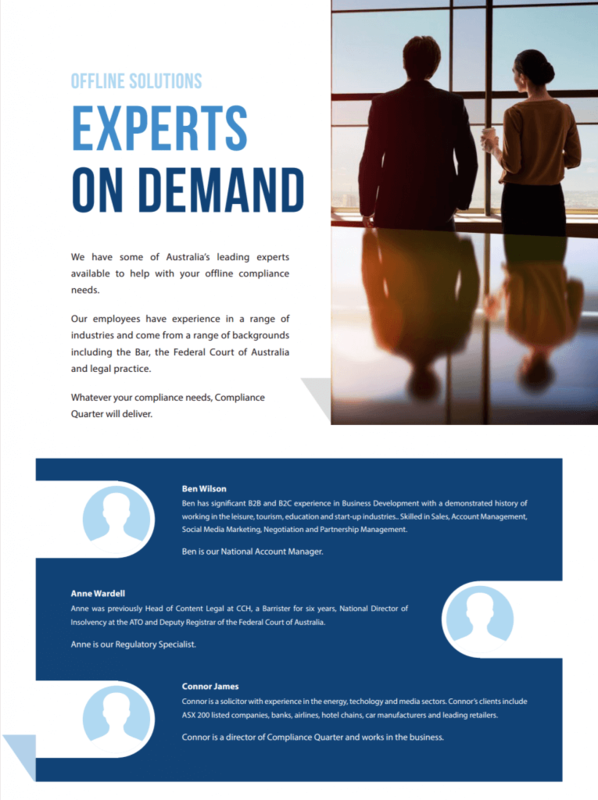 Compliance Quarter provides a range of solutions to meet your compliance needs. From the supply of personnel to projects with the delivery of licences or an updated compliance program, Compliance Quarter is the answer. Contact us today to arrange an interview. Compliance is not an easy area. For many businesses, it is a significant concern. That is why we are focusing on this area. Our objective is to make the word of compliance understandable and easy to manage. Does your business have an effective compliance program? An effective compliance program is one that is integrated into the business, one that identifies and manages regulatory risk. An effective compliance program demonstrates your sustainability as a business to your customers, partners and regulators. Contact us today for help in managing your compliance program. Compliance Quarter has significant experience in obtaining licences for our clients. From trade promotions to energy retailer, we are able to ensure that your application will be assessed correctly and that it will cover all obligations. Contact us today for any applications needed. The implementation of an effective compliance program requires the commitment of the whole company. There may be times where the objectives of the compliance program conflict with the objectives of the other areas of the business. There may be times where the objectives of the compliance program conflict with the objectives of the other areas of the business. Your Compliance Offer should have the independence to make hard decisions and ideally report directly to the board. Compliance Quarter is able to provide a Compliance Officer on a contract basis, with the direct objective of increasing the integration of your compliance program.